By Steve Kaufman. Instructional/Guitar/DVD. Bluegrass. DVD. Homespun #DVDKAULF29. Published by Homespun (HL.641587). ISBN 0634061313. 5.25x7.5 inches. Taught by Steve Kaufman. This long-time video favorite is now available in a DVD three-pack! 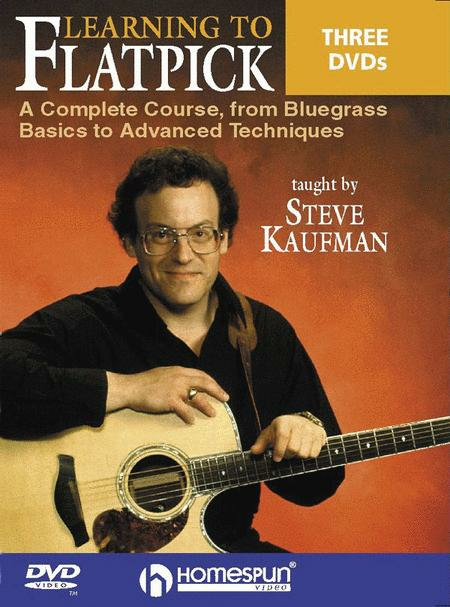 Steve Kaufman's comprehensive course in bluegrass flatpicking starts at the beginning level and takes students to advanced techniques that will enable them to hold their own in any band or jam session. He helps players develop a solid repertoire of classic tunes, including: Liberty • Salt Creek • Blackberry Blossom • Ragtime Annie • Clarinet Polka • Home Sweet Home • Cripple Creek • Walking Cane • Wildwood Flower • Wayfaring Stranger • Eighth of January • Bully of the Town. 3 DVDs • INCLUDES MUSIC + TAB • LEVEL 2-4.
issues. Thanks to Homespun, the format is accessible. 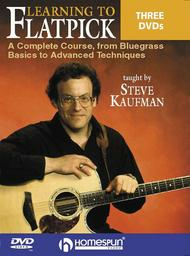 Steve focuses on helping you use specific techniques in well-known bluegrass songs. Instead of having you work through boring drills, he takes you through short songs that gradually increase in difficulty. Most songs are presented first in a stripped-down version at a slow pace and then dressed up into something a little more challenging and fun. I've had a lot of fun with this set and have already seen my skills improve. I will certainly be investing in more tools by Steve that carry the Homespun label. song but I am feeling good about this so far.